The Lemon Raspberry Cream Cheesecake is one of the many fine, decadent cheesecakes crafted by The Cheesecake Factory®. 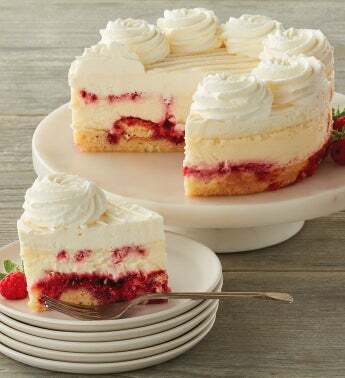 This cake starts with a base of raspberry-vanilla cake and raspberry ladyfinger cookies, with a creamy lemon cheesecake filling. Topped with lemon mousse and rosettes of whipped cream, it's tangy and playful, yet distinguished enough to serve at any elegant dinner party.